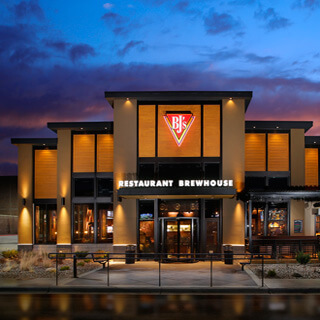 When you need to get away for a while and enjoy life with great food and beer, BJ's Restaurant & Brewhouse in Boardman, near Youngstown, Ohio is the place to go. We're very excited to be part of this community, and we know that you'll find so much to love in our extensive menu. Come in for good food, good beer, and good times at BJ's Restaurant & Brewhouse! Here at BJ's Restaurant & Brewhouse, we know pizza--it's what made us famous in the first place, and we've never forgotten our roots. Our Signature Deep Dish Pizza comes in lots of tasty varieties like BJ's Classic Combo, California Supreme, Vegetarian, and Spicy Hawaiian Chicken. Build your own pizza by choosing from our numerous toppings, or check out our Tavern-Cut offerings! With so many great choices, it's hard to stick to just one slice. BJ's Restaurant & Brewhouse may have started as a pizza place, but we've expanded to offer an impressive variety of tasty, high-quality foods. Start off the meal right with one of our Flatbreads, Shareable Appetizers, or BJ's Snacks and Small Bites, then dive in to the main course! From Handcrafted Burgers to Enlightened Entrees® to Pasta Favorites, you're sure to find something delicious at BJ's Restaurant & Brewhouse. Residents of the Youngstown area particularly love our Hickory Brisket and Bacon Burger! Just make sure you save room for dessert, because BJ's Restaurant & Brewhouse is home to the famous Pizookie®! Whether you get a classic like the Chocolate Chunk Pizookie® or something a little more innovative like the Monkey Bread Pizookie® (a local favorite), your taste buds are sure to be tickled. BJ's Restaurant & Brewhouse isn't just a place for great food--you'll find we also have amazing beer! We have a variety of beers that have won over 160 awards over the years, so you're sure to find something no matter what kind of beer you prefer. Fans of crisp, refreshing beers will love our Brewhouse Blonde® Kolsch, our Harvest Hefeweizen®, or our award-winning light beer, LightSwitch® Lager. Hopheads must check out our Piranha® Pale Ale and our Hopstorm® IPA, while those who like enjoying a smooth, robust brew will love our Nutty Brewnette® American Brown Ale or our Tatonka® Stout. We also have guest taps and several seasonal beers, so be sure to come by regularly to see what's new! When you come to BJ's Restaurant & Brewhouse, you know you've found somewhere special. Our large restaurant is perfect for all kinds of events, from family dinners to dates to larger parties--and it's also a great place to just sit back, enjoy a beer, and watch the game. Our friendly waitstaff will be glad to help you with whatever you might need so your experience can truly be special. Stop by BJ's Restaurant & Brewhouse for your next lunch or night out!